Joe and the staff at Memorial Park Cemetery put my mind at ease during the passing of my husband John. John was very special to me, so I was grateful to be in such good hands during such a trying time. The whole process was handled with care from the staff. 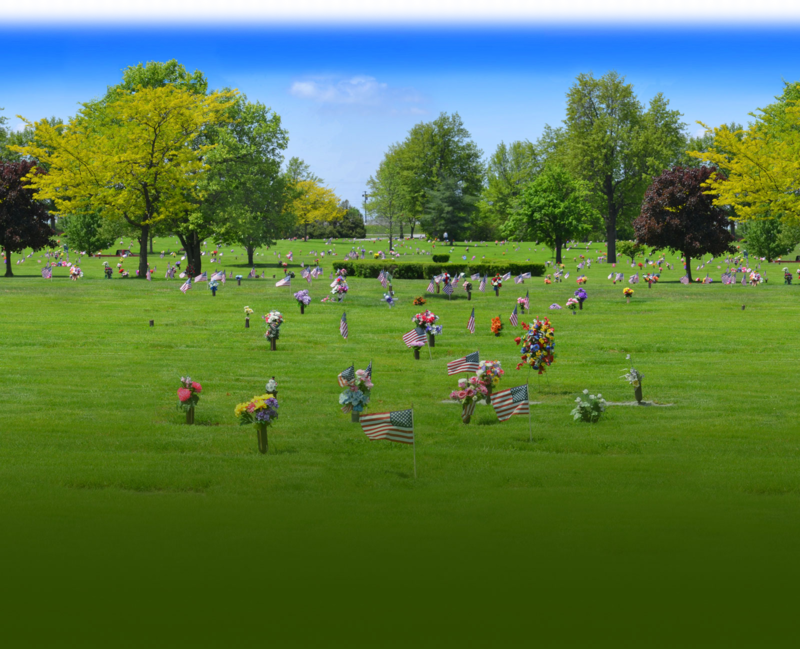 I trust Memorial Park Cemetery to handle all future arrangements. — Joyce A.
I really want to thank you for all the help you gave me with my dad's memorial service. I never had anything to do with a service before, but with your help everyone said I did a great job. But really Joe Moor and Memorial Park Cemetery are the one's that did a very good job. Thanks again Joe and your staff. - Don B. We would like to thank everyone at Memorial Park for their understanding and speedy response in fixing our flower vases on our family monument. When we received a call from the Park that same day saying our vases had been fixed we were obviously surprised. We visited the next day and found everything had been taken care of like they recommended. - Steve & Kathy N.
Thank you for everything that you have done. The best Christmas I ever had. Thank God for folks like you. - Mabel G.
The grounds are beautiful and the staff is very professional. Lacey made us feel at ease and comfortable with the choices we made for our mother. I would definitely recommend Memorial Park Cemetery. They are a bright spot at a very difficult time. - Paula S.
I called Memorial Park Cemetery because I live in Arizona and was having trouble contacting someone to order a headstone for my brother. I was put in contact with Lacey and within 20 minutes she emailed me back a perfect sample of what I was looking for. I can't express how happy I was to work with such a professional and courteous individual. - David M.
I would like to thank you for being so kind and helpful when we were in your office. Much appreciated. - Mary Lou & David F.
I want to again thank you on behalf of myself and my brothers for the wonderful job you did helping with the interment of my parents ashes. Even though time has passed since they left us, it nevertheless was hard to say goodbye. Your caring help made that situation much easier. Everyone at Memorial Park was incredible to work with. Our stay in Ohio was memorable and something I will never forget. - Jon F.
I wanted to express my thanks and appreciation for the help I received when planning the burial and monument for my parents. Lacey is an amazing young woman who is so professional, helpful and compassionate. She really cared about my feelings. The stone was placed in a timely manner and I couldn't have been happier with the results. Thank you so much. - Susan H.
From the first time I contacted Memorial Park Cemetery they were so attentive to my needs. My husbands grave needed to be sodded and the headstone reset, done. Looked so nice for my out-of-town daughter when she went to the Cemetery during Thanksgiving. Very very thoughtful people. Thank you! - Etheline M.
This letter is to thank you and your wonderful staff for all the help and guidance during a time when grief and stress become a part of your everyday life. In May of 2016 I lost my sister and 42 days later my mom. Both of these women were incredible in their everyday walk of life so naturally their deaths affected a lot of people. I can’t begin to express how wonderful Memorial Park Cemetery was in dealing with the losses. Compassionate and extremely accommodating to my family. During this time I made a mistake on my mom’s memorial plaque and instead of you saying sorry there's nothing we can do, you helped resolve this matter. I live in Waynesville, Ohio and my husband and my final resting place will be there and I can’t imagine those who will take care of my business dealing with anyone else but you and your staff. Again I sincerely thank you for all you have done to help with my grief. - Barbara L.
We would like to thank everyone at Memorial Park for their understanding and speedy response in fixing our flower vases on our family monument. When we received a call from the Park that same day saying our vases had been fixed we were obviously surprised. We visited the next day and found everything had been taken care of like they recommended. -- Steve & Kathy N.
© Copyright 2019. Memorial Park Cemetery. All rights reserved.